Well I’m still on my little new year organizing streak..it’s probably being helped along by the Arctic climate outside. The more time I spend inside these four walls the more I need functional and pretty around here. I’m a big fan of EXPEDIT units from IKEA. They’re affordable, absolutely fit the bill for functional and pretty storage, and can be styled to suit pretty much any space. We had a larger EXPEDIT unit that was storing boys’ bedroom stuff which wasn’t needed anymore. We sold it on kijiji and bought this smaller one instead to sit in my crafty corner of the basement. We kept all the drawers and bins from the previous EXPEDIT so I worked with what I had to create storage, and style the new one. 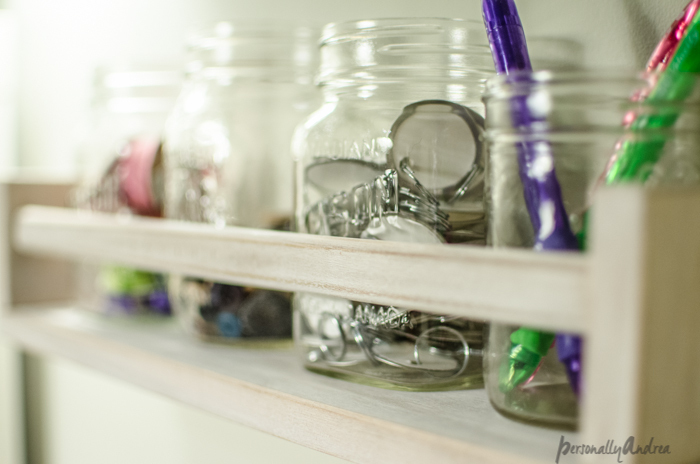 I was inspired by this pin on my OrganizingStuff board to go for a Pottery Barn style look. I re-used the wicker bins and numbered them Pottery Barn style. Do you recognize the number tags from this project? I’ve recycled them here. Then I added a shipping tag to identify the contents of the bin. I painted the drawer fronts with chalkboard paint. If items get added or used up from a drawer they are easily re-labelled. Or I can just doodle if I feel like it! Also the little knobs that come on the EXPEDIT drawers are tiny and boring, and the first rule of upgrading cabinetry is to switch out the hardware. I have some vintage keys that I bought at this antique market and decided it would be fun to use some of them here. I simply attached them with some jute twine. In a perfect world being creative should be fun and productive. Sitting in and staring at a disorganized mess is neither of those. It was worth some small investments, then I shopped my home for storage I could repurpose, and used some things I loved to personalize my space. Do you have a crafty space that you love? Or are you inspired to make over a corner of your home? It doesn’t have to be complicated or expensive. It just needs to work for who you are and what you do. Go ahead…be inspired and be creative…that’s what Pinterest is for!